The mobile market has evolved exponentially due to a greater demand for next-generation technology. Today's sophisticated end users require mobile applications with more processing power, flexibility, reliability, security and integration with other applications. GlobalLogic has the tools, processes and experience necessary to help ISVs develop mobile applications quickly and cost-effectively. Mobile Advertisement & Ad Engines. 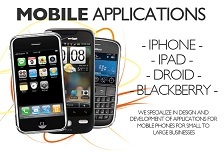 Developing mobile applications in J2ME, BREW, Android, iPhone, Symbian, Windows Mobile and BlackBerry. Conceptualizing mobile applications and eliciting requirements (e.g., UI design, prototype, wireframes, user stories). Porting mobile applications between platforms and devices. Developing server-side and infrastructure, including for location & mapping services. Integrating third-party components on the server side (e.g., SMS/MMS, billing, feeds, ads, content, etc.). Integrating carrier, SMSC and billing systems (e.g., LBS platform for location determination). Coordinating with carriers and device manufacturers for mobile application testing and certification (e.g., NSTL, Java Verified). Launching and distributing mobile applications. Application Stores (e.g., iPhone App Store, BlackBerry App World, Android Market, Samsung App Store, etc.). Providing maintenance and product support services. To run the development procedure smoothly we used to follow two basic step for a mobile application development. Requirement analysis and specificatoin preperation is the first step. Second is the design and development phases. Analyze the client requirement and technocial specification (if any as sometimes client may not have any specific technical explanation on his requirement). If our honorable clients doesn’t have any specific technical specification on his requirement, he had to undergo a paid service with TechnoVilla Solutions Limited to get the technical specification ready for the development process by the expert technical analyzing and technical writing team of TechnoVilla Solutions Limited. And based on the technical specification the PM will identify the cost and timeline for discussing with client. Once this step is done client may go for further development procedure by placing an work order. This is the core development part. After receiving the work order the Project manager will discuss with the client to fix some milestone, so that client may notified on what’s going on with his project. On completion of each milestone (including the QA for the work done so far) on or before the end of initially decided timeline client will check it and approve to go for the next milestone. In the middle if any complexity arises this will be taken care of by our experts with top priority. If still any further bug found on the QA process in the already developed product, this will be fixed in this phase. This is usually a maximum of 5 working days job. Once everything is perfect in the devlopment server we will provide you a user guide to understand the how-to for the software to be used by end user. Once reciving everything to be 100% perfect from client end we go for the deployment. After deploying the product to the live, if any further bug found, when end users using the product widely, one month of free of cost support is provided.